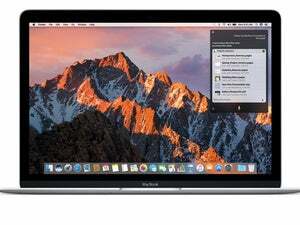 A look at using the Apple's virtual assistant on the Mac. Siri is the marquee feature in Apple’s next operating system for the Mac, macOS Sierra. Yes, Siri: Apple’s voice interface that was introduced nearly five years ago on the iPhone (and was a stand-alone iOS app before the company was acquired by Apple). If you use Siri often on your iOS device, then you’ll find Siri on the Mac to be quite similar. 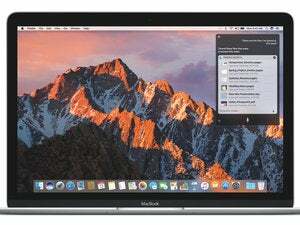 But since the Mac experience involves file management, you’ll notice that Siri can be a handy tool for finding, opening, and organizing files. When you install macOS Sierra, the installer will ask if you want to enable Siri. If you don’t want to enable Siri at installation, you can activate it later in the System Preferences. 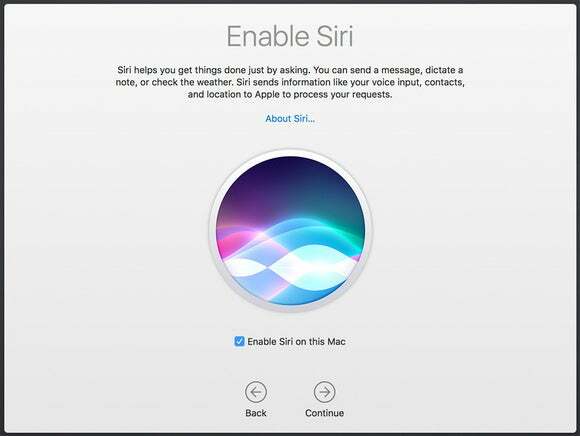 You can activate Siri during the macOS Sierra installation. When the Sierra installation is done, you’ll find Siri icons in two locations: In the Dock, and in your menu bar. By default, Siri’s Dock icon sits next to the Finder icon on the far left side. You can move the Siri icon in the Dock by dragging it. Up in your menu bar, you’ll see a color Siri icon next to the Notifications icon on the far right. ...and on the menu bar. You can launch Siri by click on either of these icons. You can also set a keyboard shortcut in the Siri System Preferences. The default option to activate Siri by keyboard is to hold down the Command and Space keys at the same time. There isn’t a way to set a Trackpad gesture to launch Siri. One thing that I often do with my iPhone is that I inadvertently launch Siri. This mostly happens when I am pulling my iPhone out of my pocket—my finger grabs a hold of the Home button and Siri launches. Inadvertently launching Siri isn’t as easy (for me) on the Mac, especially with the default Command-Space hold down, though I could see it happening if you mistype a custom keyboard combination. If it does happen, you can deactivate Siri by pressing the Esc key. 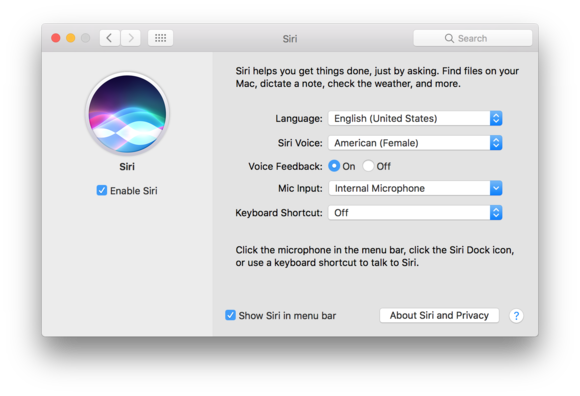 On iOS, you can activate Siri by saying “Hey Siri.” Vocal activation isn’t available in the Siri system preference in the Sierra, but there is a workaround. Here’s how it’s done. If you use the VoiceOver and Switch Control accessibility features on the Mac, Apple says that Siri will work with those features. 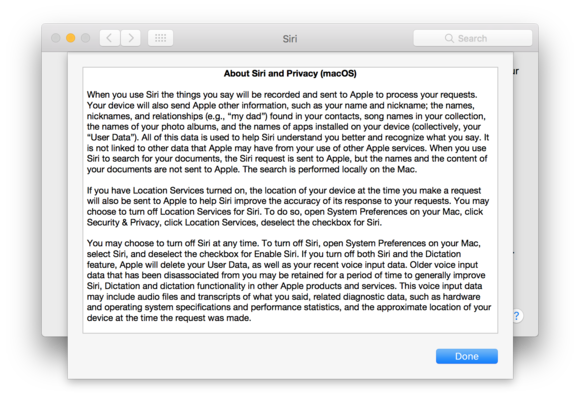 Siri settings in macOS Sierra. I’ll dive more into Siri’s settings in a bit. 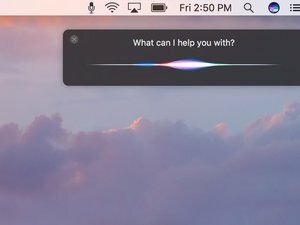 Let’s go into what you came here for: Siri for macOS in action. Once you launch Siri through the Dock or menu bar icon, or by a keyboard shortcut, a Siri window appears in the upper right corner of the screen, along with the familiar two-beep Siri tone. If you don’t have an internet connection, Siri won’t work. Since most people are used to using Siri on iOS, your first inclination is to use Siri for Mac as you would on your iPhone. For example, you might use Siri to look up showtimes at nearby movie theaters. For upcoming events, you can take the Siri results and pin them to Notification Center. Siri for Mac is appealing as a tool for managing files. One of the Siri demos shown at WWDC was the ability to show file based on a given criteria. It worked for me, even with my files being saved to Dropbox. You can also use Siri to make some changes in System Preferences. Siri is suited for settings you’d adjust on a frequent basis, like changing the sound volume or adjusting the screen brightness. I was able to turn Bluetooth on and off, but when I asked Siri to “Activate FileVault in System Preferences,” it said it couldn’t do it. Siri on the Mac, is, well, still Siri. It still has trouble understanding me sometimes. Maybe it’s the way I talk, I dunno. But I tried several times to have Siri tell me when the Copa América Centenario championship game will be played, and this is what I got. Siri overall still needs improving in terms of understanding vocal commands and finding relevant results. But Siri for macOS will be a helpful UI tool. Back to Siri’s settings to cover the other adjustments you can make. Language: The default is English, but you can change it to another language. Voice: Everyone is familiar with the female American Siri voice, but if you use English, you can change it to a male American voice, a male of female British or Australian voice, or a female Irish or South African voices. Voice Feedback: With this setting on, Siri will always provide a voice response to your query. Mic input: If you have external microphones, you can use this setting to select it. If you click About Siri and Privacy, you get the following window.